Green Party presidential candidate Jill Stein received less than 1 percent of the vote on Nov. 8 and got only 36 seconds combined of coverage from ABC, CBS and NBC for the entire campaign. The same networks who ignored her third party presidential bid, however, can’t get enough of her recount effort. In four days, ABC, CBS and NBC devoted 7 minutes and 26 seconds of coverage to Stein. 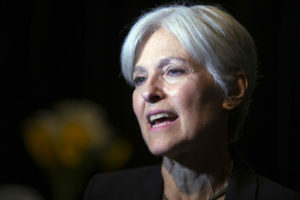 Even though President Barack Obama himself said there was no evidence of election fraud and Stein also admitted she had no proof, the “mainstream media” have given heavy play to the story. She has not explained why only Pennsylvania, Wisconsin and Michigan deserve integrity in their voting systems.